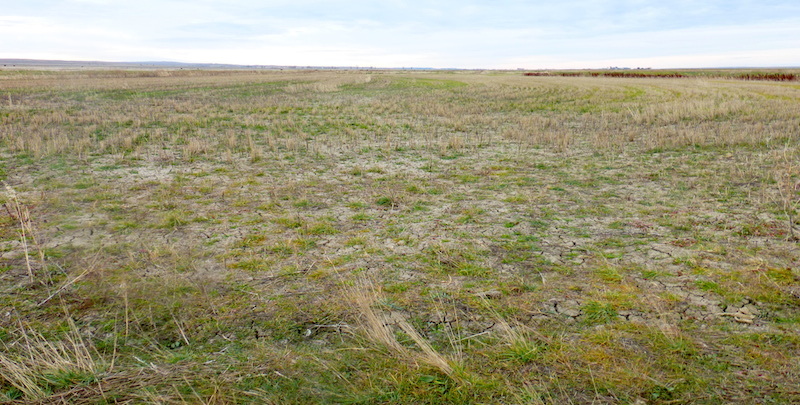 The Reserve’s location was decided based on several factors, including the fact that much of the land in the region was never plowed. For the disturbed areas that are now owned by American Prairie Reserve, we are actively working to improve the soil and native vegetation. In 2015, Reserve staff started the restoration of 655 acres with the goal of returning a diversity of native grasses, shrubs, and wildflowers to sites in the White Rock and Sun Prairie North regions. A custom seed mix has been developed with the help of the Malta NRCS and a regional supplier, and soil work began last spring with assistance from a local farmer. This year, Reserve Assistant Ellen Anderson will monitor the progress at the restoration sites and continue to convert vegetation to more native species. Reserve Assistant Ellen Anderson is leading our restoration of plowed lands. Read an interview with Ellen about her work to restore soils and native plants. Out of the 305,000 acres that the Reserve currently manages, Ellen Anderson's 655-acre project area makes up most of what we need to tackle until more lands are added. Spring to fall, the nooks and crannies of the prairie are home to wildflowers in all shades of the rainbow. Here on the Reserve, grass isn’t ornamental – it’s an important part of the circle of life. We see invasive species like Kudzu or the Emerald Ash Borer in southern and midwest areas; are there species that are hurting the prairie? Read more about Are Invasive Plants Hurting The Prairie?